Summer time is well and truely here, and some of you maybe have been getting the itch to lighten your dark hair. 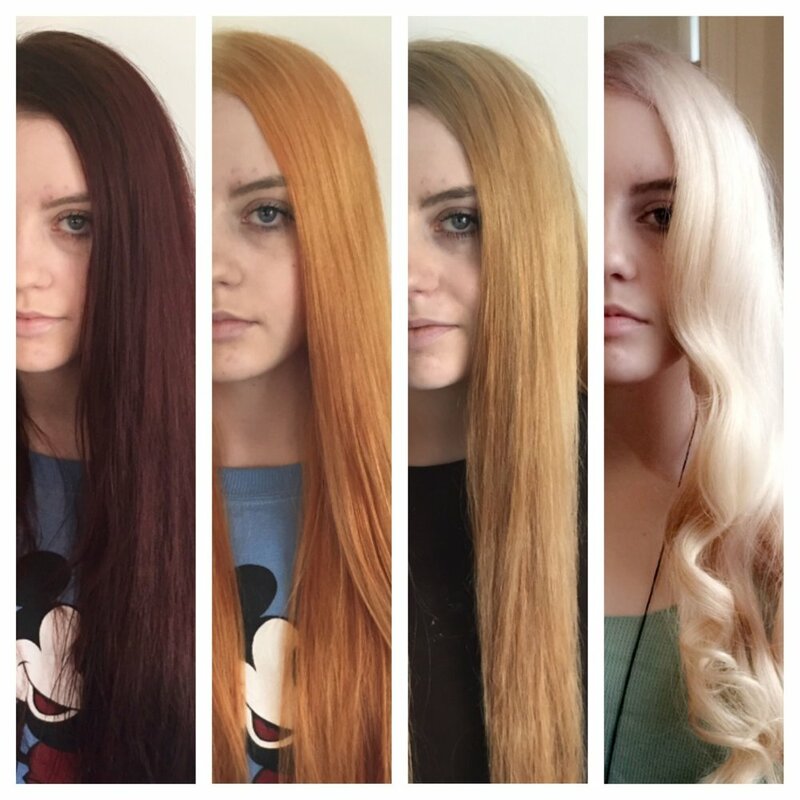 The process of lightening and lifting hair colour is a chemical process, which can be executed in a few different techniques depending on the result you are striving for and the history of your hair. This can be for example highlights, balayage, all over bleach or a deep colour cleansing (colour removal). The history of your hair is bascially all those dye jobs you have had done from the root to the the ends of your hair. If you have a short pixie crop, then lucky you, as your hair is around 3-4 months old, and will most likely lift to the colour you desire. However for those of you who have a little longer hair, or "down to the small of your back" long hair, like me, then that 6 years of past dye jobs becomes quite relevent in making the plan for your blonde ambitions. The easiest hair to dye of course is virgin hair and the majority of virgin hair will lift easily, bare in mind some types of hair will take a little longer, like thick dark hair. If you have dyed your hair with permanent hair colour like a black, dark brown or red, you have to expect that these colours will make appearance in your hair lightening journey. All colours from different brands respond differently under bleaching and colour rinsing processes, and therefore if you plan to embark on this journey, it is best to be patient and prepared not to have your hair goal on the same day you walk into the salon. For example, if your hair is coloured with permanent black hair dye and your goal is to be ice blond, you first have to accept that it could take a few months to reach the end result and secondly that it may not be possible for your hair to reach that colour. In addition, you hair condition will be changed dramatically and will become dry, damaged, with breakages and split ends. Therefore aftercare is really important. "It is always best to get a intensive repairing hair treatment in the salon after bleaching your hair and opt to have L'Oréal Smartbond added to the bleach mixture so that less damaged is caused. In the following months you need to put proteins back into the hair to help improve the hair's condition. Proteins are essential to rebuilding the structure of the hair and using protein-enriched products can reduce hair breakages up to 75%. Buy a specific mask for dry, damaged, over-processed hair, like Kérastase Resistance Therapiste Masque whilst also using anti-split treatments like Redken Extreme Ant-Snap Leave-In Treatment for Damaged Hair and Length Sealer Split-End Treatment." At Escape we use L’Oréal Professionel Smartbond that is a three part system, which we recommend and offer to all our customers undergoing hair lightening technical services. So what is it that Smartbond does exactly? Part 1 is a product, which colour technicians add to colours, ligtheners & bleaches, that helps protect and strengthen hair bonds during the lightening process. Part 2 is a Pre-Shampoo that is to be used on the hair after rinsing out the color or bleach. This helps rinse off all chemical residues, which could break weak bonds. The last product Part 3, is what you can buy to take home with you, which continues to strengthen the fibers week after week. It is recommended to used every third wash, as a conditioner after shampooing your hair. We welcome all customers to come into the salon at Escape Hairdressing for a free colour consulation or advice abour all hair colouring services and products.